I’m not a big science fiction fan. But I am a big fan of the book “Starship Troopers.” While I was a Company Commander my Battalion Commander (LTC Baker) assigned his subordinate officers to read this book for an OPD. At first, I wasn’t very excited about the idea. I had seen the movie and enjoyed it, but didn’t think I would like the book. From the time I first picked this book up and started reading it, I was in complete awe. Not only is the book entertaining, but it is absolutely loaded with great quotes about life and military leadership. I’ve picked 17 quotes from the book that really inspired me and shared them below. Over the next 17 days I am going to write a daily post about each quote and share my insights to it. I guess you could call it a mini-series, the first of its kind on my website. If you haven’t read Starship Troopers yet I hope you will order a copy and follow along with me. You can learn a lot about leadership and about life from this book. My goal is not to reveal what’s in the book. I don’t want to review the plot and spoil it for you. Instead, I simply want to share some of the golden nuggets that really helped me become a better military leader and citizen, just from reading the book. This is the first post in the mini-series and there will be 17 additional posts in the next two and half weeks. Please check back to my website each day to follow along in this series. As you follow along, I’d love if you left a comment with each post to tell me what you think. Once again, in the next 17 days I will write a blog post to elaborate on each lesson, sharing my own thoughts and insights. I hope you will follow along and share your thoughts by leaving a comment to each post. I must admit, when I first saw the idea of a science fiction piece being used as lesson learning in the real world, I was flabbergasted. After reading these quotes though, I truly understand what you are saying. My wife and I watched a science fiction movie last night called After Earth with Will Smith. Lessons on family relationships were taught through it. There are lessons that can be learned through Science Fiction. Thank you for this post. This book is just filled with wisdom, even though it is in science fiction format. The movies rarely follow the books, or even do them justice. I have heard of the book, but didn’t realize it had so much depth (I guess you really can’t judge a book by it’s cover). I’m tempted to read it myself now. I really like Lesson #5, for it distinctly illustrates the importance of buy-in and cooperation of not only soldiers, but of anyone endeavoring to accomplish a common goal. Forcing someone to accept something or to do something will result in resistance–remember, “for every action there is a reaction.” The difficult application process the writer refers to ensures that only those who really want to be there are accepted. Commitment will be high, important to the overall success of the group. 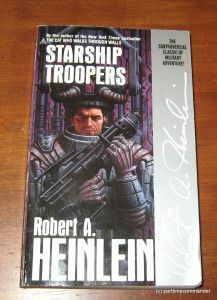 Heinlein’s Starship Troopers is a classic of hard science fiction, and while the movie is entertaining, it bears little resemblance to the book. The portrayal of a future military culture is outstanding, and some of the concepts–earning full citizenship through military service, for example–are thought-provoking. Good science fiction is meant to be thought-provoking, of course, so it’s well worth a read. I’m glad you like the movie Daniel. I must admit the movie is entertaining, but it isn’t anywhere near as good as the book. This book is such a great read for military leaders. First time I was ever suggested the book I kind of looked at it as silly. I had also seen the movie so automatically had some assumptions about the material… Glad I looked past that and read it. So many valuable lessons I took from it and this miniseries is a great way to provide leaders good insight to the lessons of the book.